As a young nun, Philippine longed to travel to America. In the late 1780s, France sat perched on the edge of Revolution. But the mind of schoolgirl Rose Philippine Duchesne was somewhere far, far away. Returning missionaries regularly spoke at Philippine’s school, captivating her with tales of their adventures in North America. Philippine felt God was calling her to the American frontier, to save the souls of the American Indians. She spent her entire life trying to answer that call. When she was eighteen, Philippine went with her aunt to visit the local convent. Once inside, she flatly refused to return home. Philippine’s decision to become a nun infuriated her father, but he found himself no match for her iron will. Philippine’s faith remained strong through the tumultuous years of the French Revolution, even after her order was disbanded. She soon joined a different order, the Society of the Sacred Heart. The nuns of the Sacred Heart admired Philippine’s passion, but did not share her dream. For years, Philippine begged her superiors to send her to America, to fulfill her destiny. In 1817, they relented. At age 49, Philippine made the long trip across the Atlantic, steamed her way up the Mississippi, and arrived in the village of St. Charles, Missouri. Finally, Philippine thought, she would be able to bring her faith to the Indians. Her Bishop, however, didn’t see converting Indians as a priority. He ordered Philippine to instead establish a paid school for white girls in St. Charles. Philippine, with her characteristic stubbornness, negotiated a bargain: she would open a free school, and charge only those who could pay. Also, one day a week would be reserved for teaching Indians and enslaved Blacks. But even on her amended terms, the school was hardly what Philippine had had in mind when she left France. 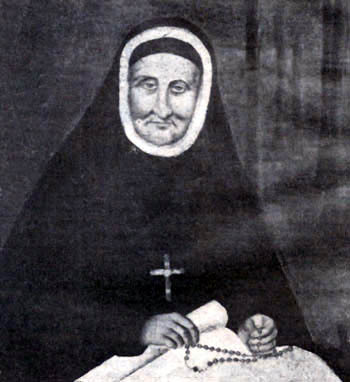 Rose Philippine Duchesne, 1769-1852. This portrait is believed to have been made during her time in America. Philippine’s first year in St. Charles was spent in destitution and near starvation. And just when things started getting better, the Bishop called her away to a new task. He sent Philippine to Florissant, Missouri, to oversee construction of a new convent. There, she met a group of newly arrived Jesuit priests, sent to America to serve the Indians. Philippine befriended a young priest named Pierre-Jean De Smet, whom she talked with about her calling and her frustrations. In the 1820s, the government began removing Eastern Indian tribes to reservations in the West, and Philippine’s dream grew further from her reach. Fortunately, she had plenty of work to occupy her. She built new schools and convents up and down the Mississippi. In 1828, she moved to St. Louis, where she raised enough donations to establish a large school and orphanage. But her growing responsibilities took a toll. At 65, she was slowing with age, and could not see eye-to-eye with the young nuns arriving from France. Despondent, she resigned her position as Mother Superior, and returned to Florissant. “I feel that I am a worn-out instrument,” she wrote, “a useless walking stick that is fit only to be hidden in a dark corner.” Given her choice of rooms in the convent at Florissant, she selected a narrow cell beneath the stairs. 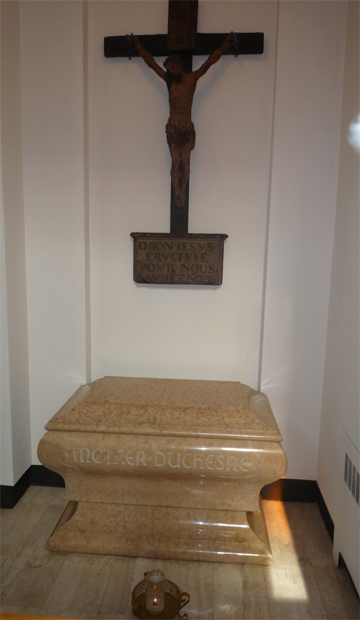 The tomb of Saint Duchesne in St. Charles. When it came to prayers, Philippine did not disappoint. Grateful to be realizing her life’s purpose, Phillipine’s typical day at the mission included a full eight hours spent praying. A Potawatomi story tells that one night, while she knelt at the altar, a curious boy dropped a few kernels of corn onto the back of her flowing robes. In the morning, he found Philippine still at the altar, and the corn undisturbed. From then on, she was known to the tribe as “The Woman Who Prays Always.” Despite her wish, Philippine did not die among the Potawatomi. Only a year into her missionary work, her Mother Superior visited the reservation, and discovered Philippine’s health was failing rapidly. She ordered the elderly nun back to St. Charles, and took personal responsibility for her well-being until Philippine’s death in 1852. After she passed on, Philippine’s legend grew. 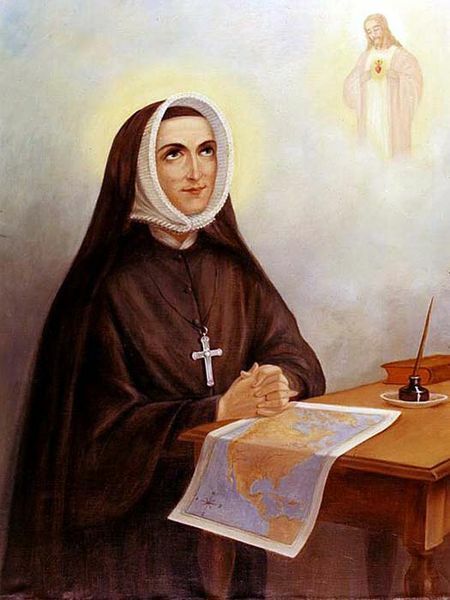 Father De Smet had always said that “never did I leave her without the feeling that I had been conversing with a saint.” In 1895, her order introduced her cause for sainthood. The Church canonized Philippine as a saint in 1988. Philippine’s convent in Florissant is now a historic site, the Old Saint Ferdinand Shrine. The site of her missionary work in Kansas is preserved as Saint Philippine Duchesne Memorial Park. Philippine’s holy remains rest in a marble tomb in St. Charles, on the grounds of the school she founded in 1818. When Pam was still in charge at Boone in Defiane – I saw a young woman whose persona was that of an early nun. I wish I knew if it was Rose Philippine Duchesne. I only remember how impressed I was with her research and reproduction of the habit, etc. Thank you for this – very interesting. oops – wish I could edit that. Sorry. Defiance mispelled. Anyway – very good information. Thanks.